The secret to this sauce is in the accuracy of these steps. Be sure to read through the entire recipe before you make it. 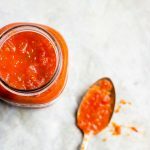 The sauce will can stay good refrigerated in an airtight container for up to 3 days, and in the freezer for up to 6 months. In a large sauce pan heat the olive oil over low heat. Toss in the onions, garlic, salt and pepper, and sweat for 3 minutes. Next stir in the tomato paste and 1/4 cup warm water, and simmer for 1 minute. Then add in the water and tomatoes, and stir to combine well and cover. Turn the heat up to medium-high and simmer for 10 minutes. Uncover, and remove from heat. Pour the tomatoes into a food processor or blender and pulse for a few seconds until you've reached your desired consistency. Add in the fresh herbs, and pulse once or twice more. You can use any kind of fresh tomatoes you'd like.